A boy is attacked by a giant monster and gets injured. 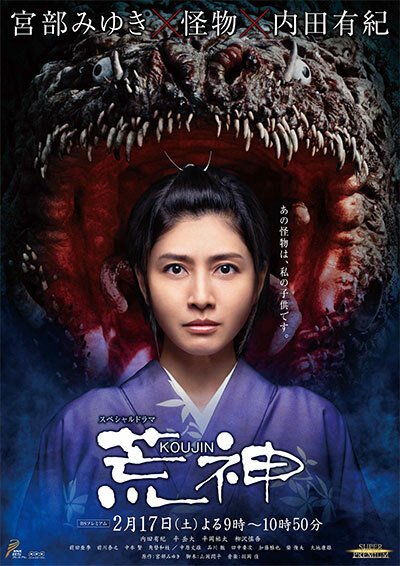 The injured boy runs to a nearby village where Akane (Yuki Uchida) lives and warns them about the monster. The residents are frightened. Akane, Soei Sakakida (Yuta Hiraoka) and Enshu Kikuchi (Shingo Yanagisawa) look for a way to protect their village. Meanwhile, Akane's older brother Danjo Soya (Takehiro Hira) schemes to manipulate the monster. Based on novel "Kou Jin" by Miyuki Miyabe (first published August, 2014 by The Asahi Shimbun).